May 10, 2018, 3:30 p.m.
Parent company Snap Inc.&apos;s first quarter financial results for 2018, released May 1, disappointed investors, sending the company&apos;s share price down to a record low. Snapchat’s slowing growth and lower-than-expected revenue are, in part, likely due to the app’s redesign disappointing another key group: millennials. 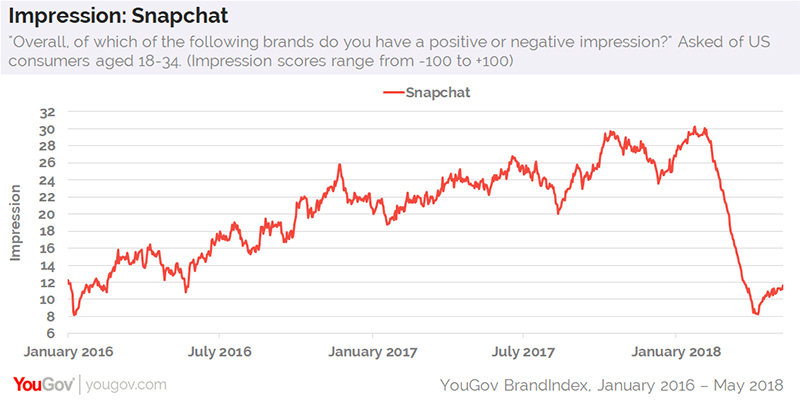 Since Snapchat began rolling out its controversial redesign late last year, the app’s Impression score — which asks consumers if they have an overall positive or negative impression of a specific brand — has tumbled from a high of 30 in late January to a low of 8 in early April with young Americans aged 18-34, according to data from YouGov BrandIndex. Indeed, the 73% decrease has essentially wiped out all the positive consumer sentiment Snapchat has gradually built since the beginning of 2016. Satisfaction levels for the app among current users aged 18-34 has followed a similar trajectory. Reaching a Satisfaction score of 27 in late January, millennials who identify as Snapchat users gave the brand a low score of 12 in mid-April. 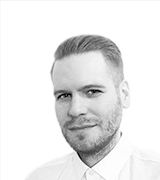 Kylie Jenner, who expressed her disappointment in Snapchat’s new layout via Twitter near the end of February, likely contributed to Snapchat’s rather steep stumble. Fewer millennials report talking about the app with friends and family these days, too. At present, only 25% of US consumers aged 18-34 say they&apos;ve discussed Snapchat in the past two weeks. Last January, that number stood 10 percentage points higher, at 35%. Additional data from YouGov Profiles shows that 26% of US adults aged 18-34 indicate they use Snapchat at least once per day, compared to 3% of those aged 35 and older. Younger consumers are also more likely than consumers aged 35+ to both say they care how they present themselves on social media (56% to 46%) and that they’re afraid of change (41% to 28%).